"Downloads List" is a simple way to maintain the Downloads area of your website. You don't have to put download links one by one using "File" block, you can simply choose a file set and the "Downloads List" block will automatically list download links for all files of that certain file set. File Sets can be defined in concrete5 File Manager (Dashboard -> "File Manager" section). You can assign file set to file by clicking on a file and choosing "Sets" option. 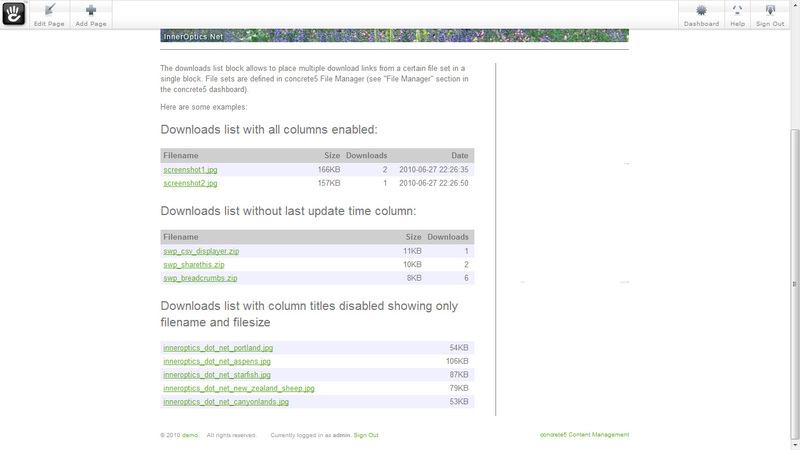 The "Downloads List" block allows to display number of downloads, file size and time of the latest file update. These columns are optional and can be enabled or disabled in the block edit interface.